We have more than 17 years of experience in EQE training. This provides a solid basis for our extensive range of IP courses. Our training courses focus on giving insight and understanding, and ensuring that the acquired knowledge can be practically applied. At DeltaPatents we thoroughly train and guide our tutors. For our tutors, training is a more than a profession; it is mastered by teamwork. As our tutors spend most of their time preparing and giving courses, they are very experienced and knowledgeable. We take feedback of attendants seriously and act on it. For us, quality and customer satisfaction are essential. For the EQE, we provide training for the Pre-Exam as well as the Main Exam, class room and distance learning. For training IP support staff, we provide several beginners courses as well as in-depth courses. DeltaPatents provides Patent law update courses on a regular basis. We provide various courses for IP managers, research & development and starters in intellectual property. We believe in teaching and treating candidates with a personal touch. You will be trained in small groups, giving ample opportunity to discuss unclear issues in more detail and get personal assistance. Hospitality is important to us. For candidates staying in Eindhoven for a couple of days, we always organize a social event, such as a dinner or a trip to a local place of interest. We welcome e-mail contact with our tutors to ask follow-up questions, to clarify course materials or to report mistakes. 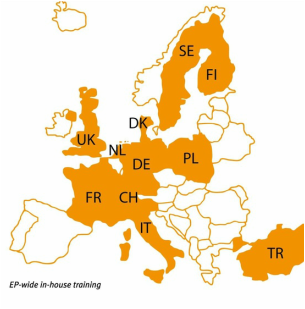 We do not only provide training in our base in Eindhoven, the Netherlands, but many of our training modules are available at different locations in Europe to minimize your travel costs. All courses can also be given in-house. If required, a module can be tailored to your local organisational needs. Please contact us if you are interested in inviting us to your office. To contact our course department please send an e-mail to: training@deltapatents.com. Keep up to date with the latest news about and the EQE Pre-Exam and Main Exam. All EQE 2020 courses have been scheduled now. Click here fora complete overview of all courses. The Pre-Exam Distance Learning course will start already in May 2019. For more information click here. For information on the EQE courses in French and German, please click on the flags. Please note that dates have been scheduled for our IP Tutorials and IP Administrator courses (for beginners as well as experienced IP Administrators). ​at the EQE Pre-Exam 2019! This year, at the EQE 2019, 100% of our Dutch candidates passed the Pre-Exam. Well done!! EPO selects DeltaPatents to train CSP candidates! We are proud to announce that, as for the EQE 2019, the EPO has selected DeltaPatents to prepare candidates of the EQE Candidate Support Project (CSP) for the EQE Pre-Exam, Paper C and Paper D of 2020. We are proud to be a leading training organization for the European Qualifying Examination (EQE). Our renowned courses can be followed throughout Europe. We are the only training organization with a complete range of courses and high quality training material for the EQE. The knowledge and experience gained during more than a decade of EQE training provides a solid basis for our comprehensive range of training courses in different areas, from starters in the IP world to experienced patent attorneys and patent managers. In 2006 we started training IP support staff, culminating in a full training program preparing for the official Dutch Formalities Officers exam. The program is audited by the Dutch Platform Formalities Officers. The training modules are now offered throughout Europe.